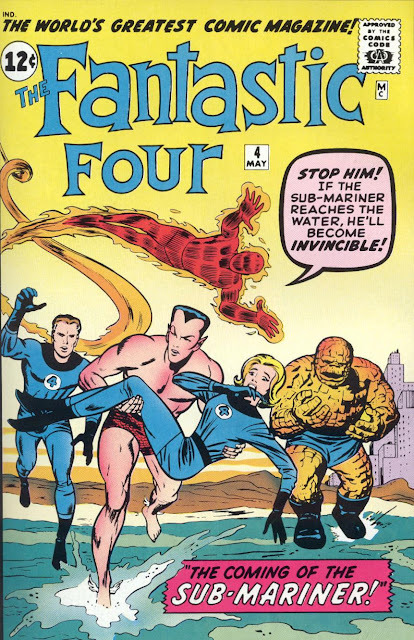 And so we get to FF #4, and the return of Namor, the Sub-Mariner - and in tracking Stan Lee's gradual realization of the world-building possibilities, this is a big one. 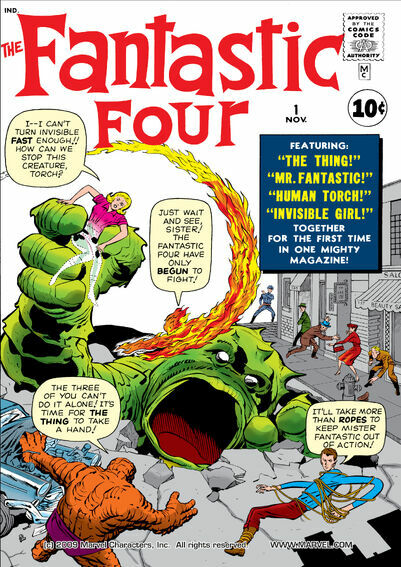 The Sub-Mariner first appeared in 1939's Marvel Comics #1, back when the company was known as Timely Comics, along with the first, android Human Torch - because, yes, even when creating his new comic The Fantastic Four, Stan Lee was open to pilfering from the greats of Marvel's past. 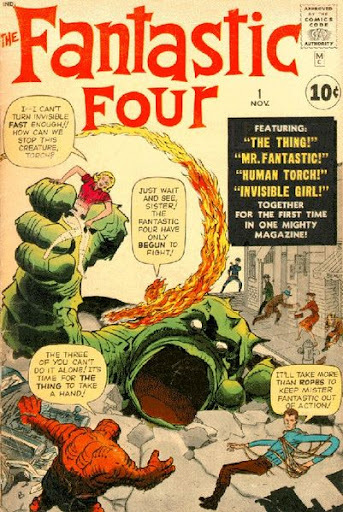 Subby and the Torch, along with Captain America (first published in 1941), were the "Big Three" around which Timely's successful Golden Age superheroes were built, and although they were almost totally absent from the '50s, there had been enough adventures during the 1940s to create a mostly-consistent world. As Stan had started working at Timely almost from its very beginning, this meant he had seen firsthand the ways in which the 1940s superhero comics had succeeded, and how having solo characters sometimes pop up in each other's strips had excited the readers. 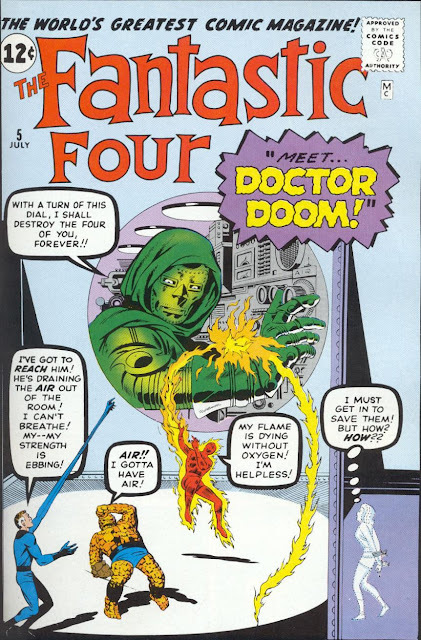 By bringing back one of Marvel's very first heroes after a virtual ten-year absence, he sought to both legitimize this new comic by attaching it to something once remembered (even if only by your parents), and instantly broaden the scope of the world that the FF lived in. But, Stan must have wondered, will it work? Other changes were afoot as well; in fact, this issue is rife with them. As last issue had the first cliffhanger ending, this issue was thus the first one to have an opening page that utterly depended on what went before. Remember, this was a huge risk: Would readers accept it? Or if they'd missed the previous issue, would they put the comic back on the rack in disgust? 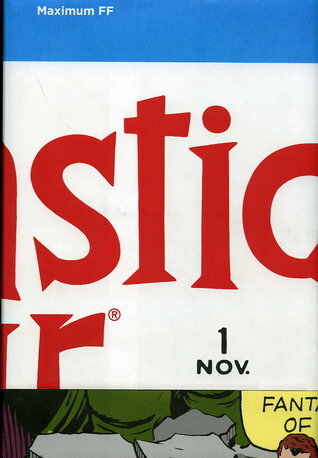 After an almost-but-not-quite-there attempt on last issue's cover, this one bore Stan's trademark hyperbole proclaiming it "The World's Greatest Comic Magazine!" - which would grace every cover for the next thirty years. 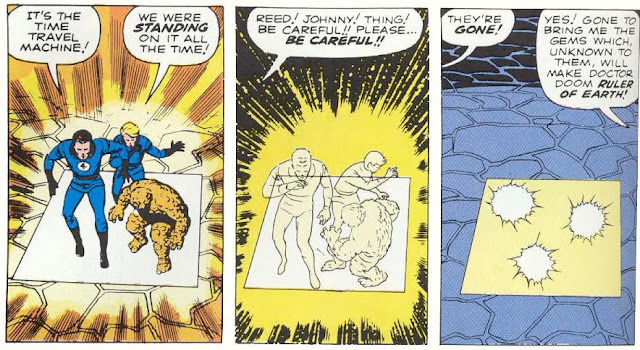 Of course, some changes were still being figured out: While the Torch had evolved to his famous red-outline form after #2, as of this issue Ben Grimm is still experiencing the occasional change to human, then back to The Thing. I don't recall this running subplot ever going anywhere; was this just a random instance of ideas tried out then abandoned? But the biggest change was that of location. 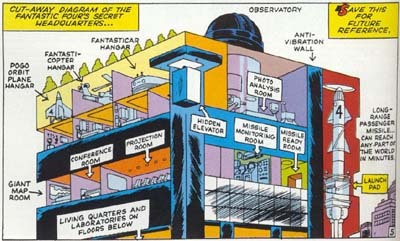 While the FF had moved into their Baxter Building headquarters with issue #3, it's here for the first time stated to be in New York City. 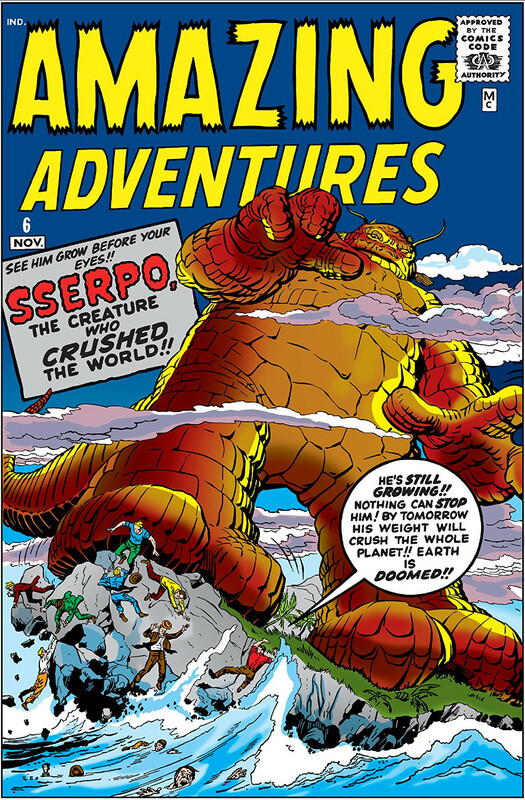 Remember that Marvel's main competition had their heroes live in fictional Smallvilles, Gotham Cities and the like; by choosing to set his new comic in not just a real-world location - but the very place in which Marvel itself operated - he cannily reinforced the sense of realism he hoped to convey with these new heroes. In fact, when Johnny comes across Namor halfway through the tale, he's living as an amnesiac bum in a dilapidated Bowery flophouse. 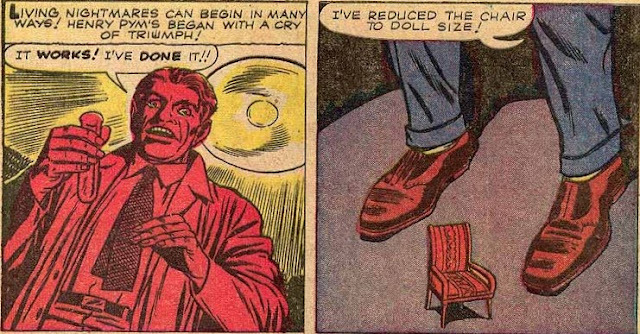 Recalling how well Subby had worked in the original Bill Everett comics - more often than not declaring war on the human race - Stan quickly reestablished him as a hotheaded, antagonistic character. 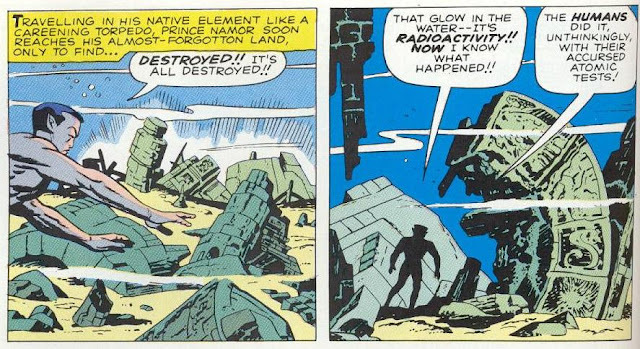 This time, he even gave Namor a tragic turn; Atlantis was shown to have been destroyed while he'd been away, and though his people were sure to be alive, he was again homeless - and all alone. Stan has talked many times how the FF was his last stab at "doing superheroes right", and a large part of that was realism (relative to the time). So he avoided the genre trope of secret identities, and likewise avoided giving them costumes. 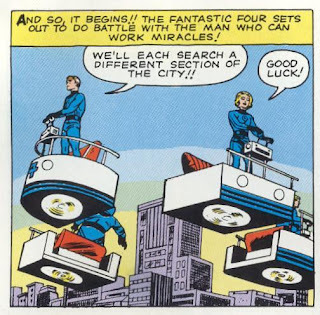 But after the first two issues, the readers wrote in to say they weren't having any of it - and Stan, quick to respond, had Kirby give them the blue suits they're known for, their Fantasticar - aka "the flying bathtub" - and their famous headquarters, the Baxter Building. No more meetings in "secret apartments"! Also noteworthy is the FF's first letters page. Stan's style of engaging the reader, and fostering the appearance of a real dialogue, is evident from the start. "So let's hear from you other readers. What types of covers do YOU prefer, and how do you feel about the name Mr. Fantastic?" Character conflicts are taking center stage more and more. 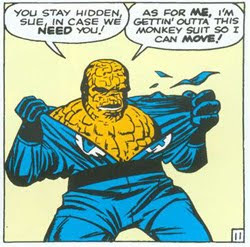 When Sue is kidnapped, Ben loses his temper and takes a swing at the Torch, who flies off. Reed yells at him: "Why can't you control yourself, Thing? Why must we always fight among ourselves? What's wrong with us?" 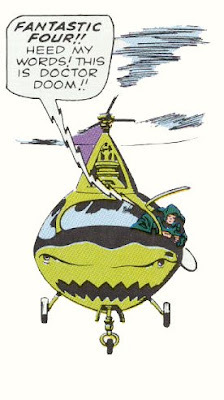 It's commonly understood now, but this really was Stan's biggest innovation, and what's largely pointed to as what quickly turned Marvel Comics into the powerhouse it would become. 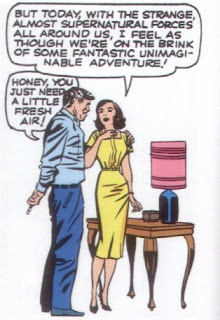 If you asked most comic readers who the next Marvel Silver Age hero was after the Fantastic Four, I've a feeling very few would peg Hank Pym. But this came out the same month as FF #2. 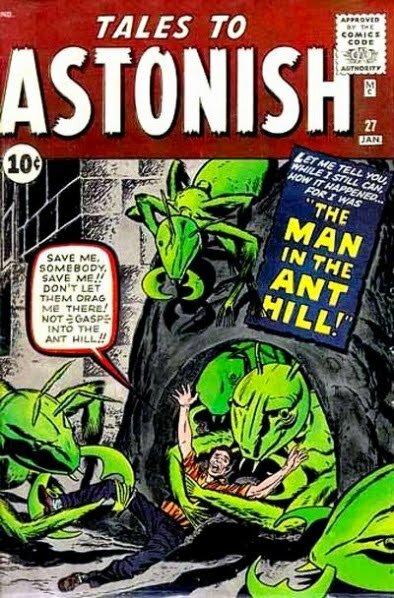 As Tales to Astonish was one of Marvel's ubiquitous anthology mags, so this first Hank Pym story was only 7 pages long. Other stories in the issue were "Mirror, Mirror, On The Wall..." (6 pages), "The Talking Horse" (5 pages), and "Dead Planet!" (5 pages). None of which were ever seen again. But then, Pym was clearly never designed to have a long future either! At the end of the tale, having narrowly escaped his harrowing experiences, Pym deems the shrinking formula too dangerous and dumps it down the drain. On its own, it reads as an enjoyable (though not terribly special) pulp story of the era - so what made them resurrect the character some eight months later? Did sales figures and letters indicate the story had really struck home? FF was originally bimonthly, so #2 came two months after #1. As far as we know, it's their second adventure. 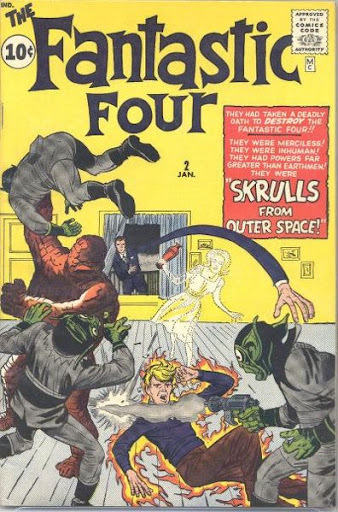 And yet, the story begins with the FF already famous for their super heroics, both to the general populace and would-be alien invaders - hence the Skrulls' elaborate plot to discredit them by committing crimes disguised as the FF. 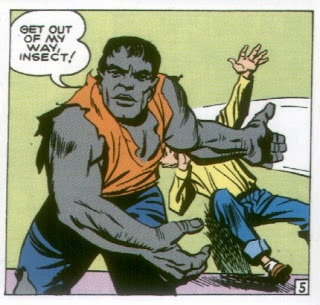 As the creatures on Monster Isle in issue #1 clearly came from Marvel monster mags of the time, Skrulls are just as clearly of the ilk seen in Marvel's sci-fi comics. (Unintentional foreshadowing?) 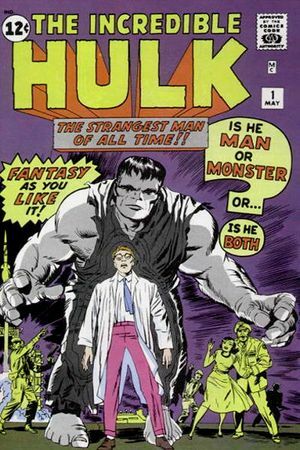 As is often the case with the early Marvel stories, it's surprising to see that from such kooky beginnings would come a race that has returned to plague the characters again and again. And check out those crazy jester collars! 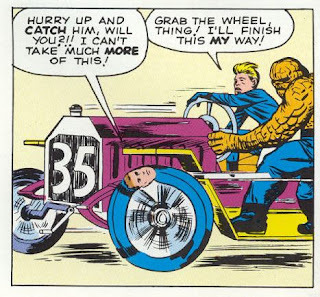 This is the first time The Thing is shown to transform back into Ben Grimm. 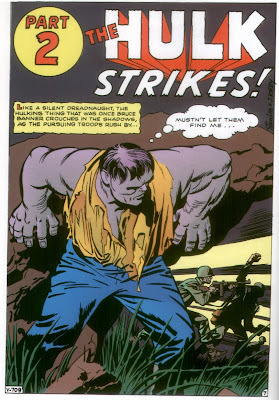 It only lasts two pages, but reminds us of the pathos of the character (especially in these early years), and the barely-contained anger and misery he constantly feels as a result; far from the gruff-but-friendly Marvel mascot he would eventually become, this early Thing is a monster, and one that the rest of the team - and the readers - expect to fly into a rage at any moment. 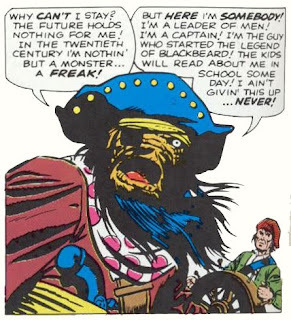 Goofy Silver Age writing: Reed defeats the aliens by showing their leader atrocities from Marvel monster books Strange Tales and Journey into Mystery. (Nice in-story promotion, Stan!) 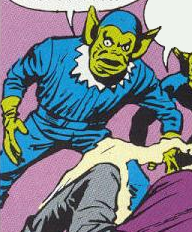 Not only does the leader take Reed at his word - Skrulls should never play poker, it seems - but he also apparently can't tell the difference between comic book art and photographic evidence. Reading slowly, one is impressed at the enormous economy of storytelling shown: We start off with 8 pages of prelude / "gathering the team" in which to build the suspense and immediately show off the powers & wonder of our cast; a 5-page flashback illustrating their origin; 3 pages setting up the threat of the Mole Man, the FF's inaugural villain; 3 more pages bringing the fight to, and then under, Monster Island; and a final 6 pages of villain origin, climax, and resolution. Whew! 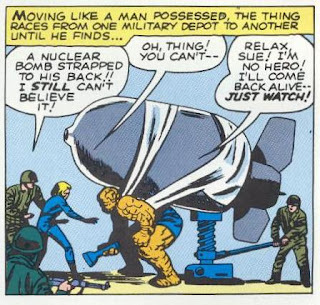 Goofy Silver Age writing: Excited at the call to arms, Johnny unthinkingly melts through the car he and his mechanic buddy have spent the afternoon working on; spooked by the appearance of the Torch, the US government sends fighter jets AND A NUCLEAR MISSILE, which Reed throws "far from shore, where it explodes harmlessly over sea" (Y'know. As nukes do. 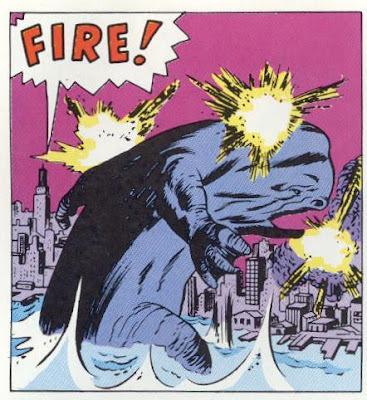 ); and in a similar theme, the story's end sees Monster Isle being destroyed in a giant mushroom cloud. 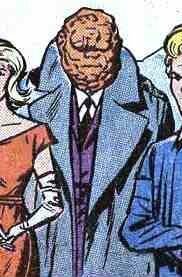 Wonder if that's brought up the next time the Mole Man makes an appearance? If you've been reading comics for any amount of time, you know that continuity can be a funny thing. In the wrong hands it can be off-putting, with story developments and shock revelations dependent on events which came years - sometimes decades - before those of the present. But when done right, the shared world concept can make the stories we're reading feel more real; events build on each other, and add to each other, to form a real sense of history and flow. My first exposure to the shared world of Marvel Comics was in 1983. 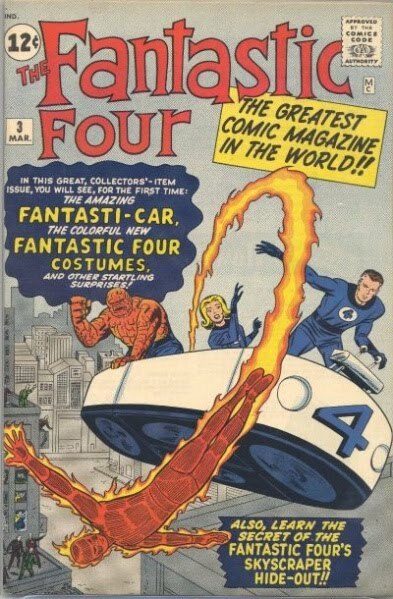 As I gradually started to experience this world, and come across references to the past - that first comic was a sequel of sorts to 1962's Fantastic Four #2, for Pete's sake! - I found myself enthralled. Here was an entire universe I'd never known, with countless stories I'd never heard of. Far from being driven away, I found such an idea exciting! Here's the thing though: At the time, that history seemed as if it stretched backwards forever, rich and deep and vast. But at the time, the Marvel Universe was only 22 years old. 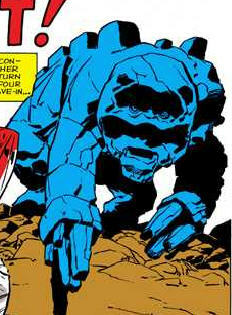 Which means I've now been reading Marvel Comics for longer than the MU had existed before I encountered it. And while today scores upon scores of new Marvel comics come out each and every month, for the first 10-15 years they were still constrained by limits which precluded them having more than a handful of titles on the stand at any given time. Yes, the Marvel Universe has a rich history. But it didn't start out that way. 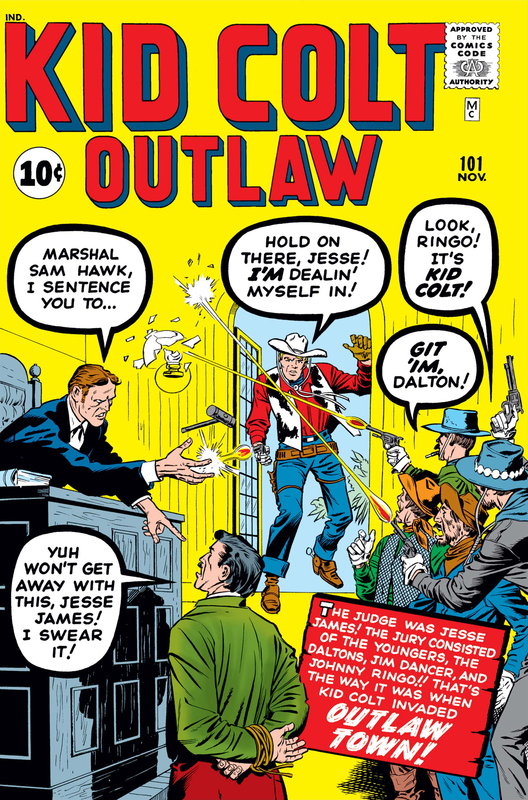 Back in the Golden Age of comics, and going right through to the '50s, most comic books - like their pulp magazine cousins - were mainly anthology books, featuring collections of short stories that were almost always one-offs; the more popular mags might have leading characters who were the star of every issue, but continuing stories of any sort were the exception rather than the rule. When did this begin to change? What made Stan Lee start to bend those rules? What were the first burgeoning steps after Fantastic Four #1 towards the shared world concept that would prove such a hit? 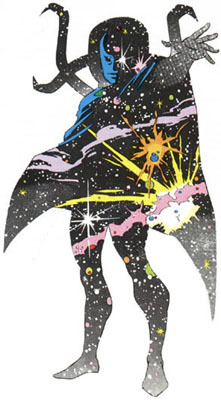 Who was the first guest star from another comic? What was the first crossover? For years, these are questions that I've wondered about without really having any idea of the answer - not with any sort of appropriate scope, at least. To do that, one would have to start reading those early Marvels one at a time, in the order of publication, to get a sense of what readers at the time might have experienced - though with the added knowledge of what we know is to come. So that's what I'll be doing here. For the first time I'll be watching the Marvel Universe grow from its humble beginnings - one step at a time - and making some notes here and there as I do. It will be fascinating, I think, to watch it slowly coalesce, piece by piece by piece. I hope you'll join me on my journey. It's sure to be an enjoyable ride! Updates will hopefully be Mondays, Wednesdays and Fridays. For a brief time I thought about a daily schedule, but that went beyond "ambitious" and into "stupid". 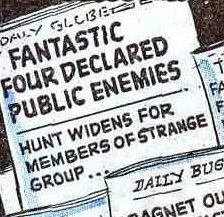 An invaluable resource here has proved to be The Marvel Database Project, and the (best guesses as to) dates of publication come from the Marvel Comics Group 1939-1980 website. Also worth noting is The Unofficial Handbook of Marvel Comics Creators. And a nice handy glimpse at the early Marvel issues, by month, can be found here, hosted at the fantastic Marvel Masterworks Resource Page. Check them out! And I'd be remiss if I didn't mention G-Mart Comics, which has been selling comics online since 1995. We may not have much in the way of early Silver Age comics - most of our stock is from the 1970s on up - but we've got a lot of everything else. And with 35% off of all new Marvel Comics - including the Marvel Masterworks and Essentials that reprint all these stories - it's a deal that's hard to beat! If you've got any questions, just drop me a line at duck@g-mart.com. You can use a newsreader, browser or other devices to automatically import the feed for this site via the RSS feed, and the livejournal feed is marvelgenesis. Finally, I'm interested in hearing what people think as this goes along, so please feel free to introduce yourself in the comments section! I'd love to hear from you.